I have previously shared some really special photographs of me on this blog. One with my parents on holiday, another with me and my dad and my favourite ever photograph of my friends and I. When asked to choose a photograph just of myself though, I struggle. I used to systematically detag every photograph of me that I didn’t like on Facebook (so about 99% of them). Embracing who I am and what I look like has been a bit of journey. I have chosen a photograph though, but this one in particular marks the start of acceptance. 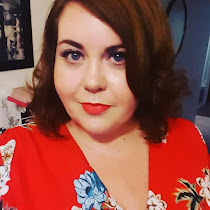 This photograph was taken for a review of a SimplyBe dress. This was the first time I had worn so many colours and such a loud print, and I LOVED it. It is probably the first genuine smile in front of a camera since I was a little girl, because back then you don’t care do you? So yes, this is definately my favourite photograph of myself. Not because of a right camera angle or even the way I look, but more what I was feeling when it was taken. Happy and hopeful. You can’t ask for more. That's such a lovely photo of you! The outfit looks amazing on you, and you truly look happy!